"THE EMBODIMENT OF WHAT I WANT FOR THE FUTURE"
RIGHT BEFORE IT WENT BANKRUPT. IN AMERICAN HISTORY PRIOR TO THE 2008 ECONOMIC COLLAPSE. FOR AMERICAN BUSINESS. IT'S A GOOD DEAL FOR AMERICA." 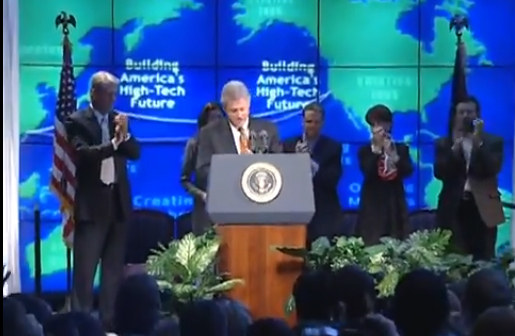 At a WorldCom conference on March 1, 2000, U.S. President Bill Clinton remarked that the company was his vision of the future. "So I say to you, I came here today because you [World-Com] are the symbol of 21st century America. You are the embodiment of what I want for the future. And because of what you do for a living every day, because of how you see and feel the way the world is changing, and how you see what it can become, you are in a position that most of your fellow Americans are not in to understand the importance of this." Unfortunately, WorldCom's "success" was based on the greatest corporate accounting fraud in U.S. history prior to the global economic collapse of 2008. It is estimated that the company exaggerated their profits by about $11 billion. When this information went public, WorldCom's stock price collapsed, and the company eventually filed for bankruptcy. The disaster at WorldCom was unfortunately just a part of the wholesale collapse of the "dot com" stock boom in the years after Clinton's speech. Indeed, Clinton's speech marked the peak of the speculative bubble. In this same speech Clinton also hailed the "benefits" of his "trade" policies with China, a dictatorship that has murdered 80 million of its own citizens. Today, the losses from that policy have reached trillions of dollars and millions of U.S. jobs. One person who probably won't be reading this report is Bernie Ebbers, the former CEO of WorldCom who introduced Clinton to the eager crowds of Worldcom employees. Today, Mr Ebbers is in a federal prison with restricted access to the internet. We're not so sure he would agree with Clinton's statement here that "We live in a time when really doing the morally right thing happens to be good economics." However, he's serving a 25 year sentence so he'll have lots of time to think about the matter. You can see Mr. Ebbers on the left in the picture below, as his company is endorsed by President Clinton before it collapsed in disgrace. 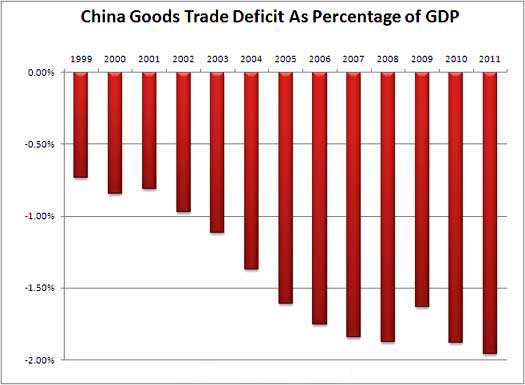 Look at this chart to see the end result of Clinton's trade policies which were continued by Bush. TIME IS A JUDGE OF REALITY. LIE SHATTERED IN THE DUST OF HISTORY. IS A WORLD THAT WILL NEVER COME TO PASS. AND MAKE THE TOUGH DECISIONS THAT ARE NECESSARY. We publish the full text of Clinton speech below for your review. Read it and make up your own mind. I am profoundly grateful to be here today, and I thank all of you for allowing me to come. I came here to talk about your future, but because this is the only opportunity I'll have today to speak through you and the media to the American people, I have to make a brief comment about one other issue. Today there was another terrible shooting in the Wilkinsburg community in Allegheny County in western Pennsylvania. We don't know all the facts yet, but it was a bad situation. Yesterday, of course, that tragedy occurred in Michigan, where the very young child was killed by another very young child. I just talked to the superintendent of schools there right before I came out. I want to say two things about it to all of you. First of all, these are personal tragedies that because of instantaneous media coverage, we all know and feel. And we owe the families of the victims and the communities our prayers and our best wishes. Secondly, as citizens, these incidents, particularly the one yesterday in Michigan, call on us to recognize the fact that we simply haven't done everything we can do to keep guns away from criminals and children. And so today I have to say, again, to Congress: You have had legislation now that would require child safety locks, would close the gun show loophole, would take other steps to keep guns out of the wrong hands for well over six months. You're supposed to take a recess next week. Before you take the recess, please, send me this legislation. It will help keep America safer. (Applause.) Thank you. This shift in our economy is changing the landscape of our country, both symbolically and literally. I mean, I first saw the landscape of Northern Virginia as a freshman in college 36 years ago, but it looks different than it did when I became president seven years ago. Everywhere you look, there's a brand new facility. This place is truly amazing. And beneath all the booming business parks and green pastures, there are countless miles of cable, conducting more than all -- over half the Internet traffic in the entire world. There are more high-tech firms in Northern Virginia today than there were farms in 1970, when the region led the state in the production of milk. (Laughter.) Here in Loudon County, there are more high-tech workers than there were residents in 1980. It has been an amazing thing. Workers like you and firms like UUNET are the new engines driving our economy. You represent about 8 percent of our employment but 30 percent of our growth over the last decade, something you can be very proud of. The new technologies that you use are also finding their ways into every sector of our economy, making companies of all kinds more competitive. UUNET provides a lot more than Internet service. Every day, you show us something about the power of ideas, the power of imagination, the power of enterprise, values that are at the core of America's character and at the bottom of this booming new globalized economy, in a marketplace that is much, much wider and fuller of possibility than any of us could have imagined when this company sold its first commercial connection in 1988. In just 12 years, you've extended your reach to 100 countries, expanding your global network by more than 1,000 percent a year. The global network is a big part of your future, and that's what I want to talk about today, and what government's role in that is. People ask me all the time: Well this is the highest percentage of growth in jobs in the private sector, and the smallest percentage in the government, of any recovery we've ever had since we can measure such things. As a matter of fact, since I've been president, we reduced the size of government to its smallest point in 40 years, since 1960. So people say, "Well, what is your job, Mr. President? What is the Congress's job?" I think our job is to create the conditions and provide the tools for you to do your job. That means we ought to invest in education and training and new technologies. There's a lot of research that can't efficiently and economically be done in the private sector. The Internet originally grew out of government-funded research which, as I was reminded today by your leaders, is one of the reasons there are so many high-tech firms in Northern Virginia. Second, we've got to give you an overall healthy economy, which is why we had to get rid of the deficits and start running surpluses and why we ought to pay this country out of debt to keep interest rates down and make capital available for other companies to grow as well. And! -- that in a world that is increasingly globalized, you're better off when they're better off. It's not good for you that African countries which are capable of growing at 7, 8, 10 percent a year are so burdened by debt that they can't educate their children or provide health care to their people. We live in a time when really doing the morally right thing happens to be good economics. But in order to do it, again I would say -- you will do a lot of in enterprising -- I have seen enterprising kids in poor African villages logging on to the Internet, you know, and finally seeing a map that's up to date, and learning geography and doing all kinds of things. People will take care of this, if we establish the right conditions and provide the tools. And one of the things that we have worked hard on is to expand trade. Under Ambassador Barshefsky and her predecessor, we completed over 270 trade agreements. But in many ways, perhaps the most important of all is the -- decision that Congress will have to make this year, and in the next few months, on whether to let China come into the World Trade Organization by giving them permanent normal trading-relations status with the United States. But I care a lot about what this country will be like when the young people here in this audience are my age, when your children are your age. This is a profoundly important issue. It is, in the short term, the kind of decision that every country would wish for. Once in a generation, you get a chance to open a market with over a billion consumers, the biggest potential market in the world. Let me explain, first of all, what this agreement does. In return for China's entry as a full partner in the World Trade Organization, the United States would gain unprecedented access to China's markets. Today, with the Chinese, we have our second-biggest trade deficit, tens of billions of dollars, because our markets are open to their products, and they should be, because we'll be better off if they do better, but their markets are not very open to our products and services. Under this agreement, Chinese tariffs in every sector, from telecommunications to automobiles to agriculture, will fall by half or more in five years. For the first time, our companies will be able to sell and distribute products in China made by workers here at home, without transferring technology and manufacturing -- never happened before. For the first time, China will agree to play by the same open trading rules we do -- never happened before. Meanwhile, we'll get two tough new safeguards against surges of imports which would threaten to throw a lot of Americans out of work in a short time under unfair trade practices. So these are the kind of changes any president, regardless of party, would welcome, because presidents, regardless of party, have worked to bring about these changes for more than 30 years now. This is a good deal for American workers, for American farmers, for American business. It's a good deal for America. But the only way we can get this agreement is for Congress to give China permanent normal trading relations. This is one of the most important votes Congress will pass in this year and for many years to come. Next month our Commerce secretary, Bill Daley, and our Agriculture secretary, Dan Glickman, are going on missions to China, with dozens of members of Congress, to meet with people in government and business and religious leaders who are interested in change in China. It's very interesting to me that the more people go to China and spend time there, no matter what they do for a living or what their perspective is, the more likely they are to favor our bringing China into the world system of rule-based trade, because this is about economics and more than economics. I want to say more about that in a minute, but just think about the economics of high-tech companies. Today China's tariffs on information technology products average 13 percent. When China joins the WTO, those tariffs will start to fall and be eliminated by 2005. China will open its Internet and its telecom markets to American investment and services for the first time. That's a huge deal. Now the magnitude of all this almost defies measurement. The number of Chinese Internet users -- let's just take that -- quadrupled in the last year alone from 2 million to 9 million. This year the number will exceed 20 million. And you know what the internal dynamics of this technology are. You know how much your company has grown. Now project that rate of growth onto a country that has over 1.2 billion people. And keep in mind, the United States is not being asked to do anything to get this agreement, except to treat them like a normal trading partner on a permanent basis, and bring them into the WTO. So, what are we going to do? China doesn't have the information infrastructure to support 500 million Internet users yet, but UUNET already has a presence in Hong Kong. You could help them to build it. (Applause.) Let's look at what happens if we didn't do it. Today, we've got a huge advantage in high-tech trade internationally. What would happen if we didn't take advantage of this? China will grow anyway, and someone else, not you, will reap the benefits of it. So if we turn our backs on this opportunity, we will be unilaterally disarming in perhaps the most vital area of our future economic growth. And let me say, finally, this is about more than money. I saw a lot of you nodding when I said it was -- it was good morally and good economics to help lift the burden of debt from the poorest African countries if they are working to try to do better. I saw a lot of you nodding when I said it was the right thing to do to buy more from the Caribbean and Latin American countries if they were doing the right thing in opening their markets to us. We have a decision to make here. The people who don't want to do this by and large think that China should not be taken into the World Trade Organization because we don't agree with all their political decisions. We don't like it when they repress human rights or political rights or religious expression. We don't agree with them that we should take little or no account of environmental impacts of economic decisions or that we shouldn't take strong steps to eliminate child labor and slave labor and things like that. So we have differences. But think of this. You know how much the Internet has changed America, and we were already an open society. I can look out in this crowd and tell that many of you come from someplace else. You know how much the Internet is changing where you came from and how much it could change if it were there. The same thing is true in China. Everything I have learned about human nature in my life, plus everything I have learned about China as president, convinces me that we're a lot better off bringing them into the family of nations, into this common endeavor, than shutting them out. Do we know what China will be like in 20 years? Of course we don't. We can't control what they do. All we can control is what we do. But here again, I think our values will be advanced along with our economic interests if we give people a chance to be good partners. If you don't give them a chance, it's almost certain that they'll react in a negative way. So I ask all of you to think about this, because normally Americans don't think about foreign policy much, but you know that with every passing day in a globalized economy, there is no longer a clear, bright line between an issue which is a domestic political issue and an issue which is a foreign policy issue. With every passing day, these issues grow closer together. Do I like it when people's religious liberty is oppressed in China? No, I don't. But it's very interesting; most of the evangelicals I know who have missions in China want China in the WTO because they know that that will make it more likely that there will be more freedom of expression, more contact with the outside world and a bigger stake in working with other countries. So this is about money, yes, but it's about more than money. It's about whether we can create a world where there's the kind of harmony across race and ethnicity and religion that there must be in this workplace that I can see just by looking around the room here. Wouldn't you like it if the world worked the way you do here? Wouldn't you like it if -- (interrupted by applause). How can it be bad, if companies like UUNET are able to make the tools of communications cheaper and better and more widely available to more Chinese people? It has to be good. I don't believe -- (applause) -- I don't believe; in all seriousness, I don't believe it's right to crack down on people for their religious views or their political expression or because they want to be in an association like the Falun Gong. I don't think that's right. But I don't believe that we will have more influence on China by giving them the back of our hand, instead of giving them the chance to build a different future. That's what this is about. And I want every one of you to think about this. Look, economically this is a no-brainer; it's in your interest. It will make this company a lot more jobs. But I don't ask you, as citizens, to check your values at the door. Every one of us believes in some things that money can't buy. But I am telling you -- you just think about what you have learned in your life about human nature -- that the leaders of China are not foolish people; they are intelligent people. They know, if they open these markets; they know, if you go in there and everybody gets connected to the Internet, that change is coming more rapidly in ways that you cannot control, and people will be able to define their future, independent of the government's ability to control it, more than ever before, whether you are talking about religion or politics or personal life choices or anything else. They know that, and they have made this decision. And we cannot let our disagreements with government policy get in the way of our interest in a long-term partnership with the most populous country on earth. So I am asking you to do something, if you agree with this. I want you to tell the members of Congress, without regard to party, that represent your state -- if you live here, you live in Maryland or you live in West Virginia -- I want you to ask them to support this. And I want you to tell them, I want you to tell them that you will stay with them on this decision if they do. Because this is very, very important. You know, I'm grateful that since I've been president America has done well. I'm grateful for the chance I've had to make a contribution to it. But frankly, I'm much more interested in whether America continues to do well long after my tenure in office. And again I say to you, you know in your business that if you want to keep doing well, you always have to keep trying to do better, and looking at the future, anticipating the changes, imagining how you want it to be. I can't imagine a world that I want for my child and my grandchildren that doesn't include partnerships that are constructed with the big countries of the world which promote human liberty as well as economic progress. That's what this whole thing is about. So I say to you, I came here today because you are the symbol of 21st century America. You are the embodiment of what I want for the future. (Applause.) And because of what you do for a living every day, because of how you see and feel the way the world is changing, and how you see what it can become, you are in a position that most of your fellow Americans are not in to understand the importance of this. So again I say to you, you're doing great. I want you to do better. And I think we can do better and do good. But we have to start this year by making sure that we don't turn away from this profoundly important opportunity.